This week we bring you the top 5 districts to do some shopping in Lisbon. together the 5 most important districts where you can find some of the best shops in Lisbon. The majority of districts and shops are pretty close to the hotel, which makes it even easier to visit. Most of the Baixa’s charm lies with the resistant shopkeepers who still stand behind wooden counters and do the sums on bits of paper, these cases are few and today the famous Rua Agusta is lined with the modern chains. A perfect combination between traditional and trendy shops, Bairro Alto competes with the big shopping centers by also offering night-time shopping in a much cooler setting, and with the possibility of sipping a drink while you shop. Lisbon’s grand avenue hosts several international designers in a perfect setting for a walk. 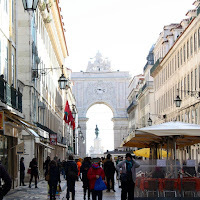 This is traditionally the quarter with Lisbon’s most elegant shops, but Chiado as grown and has now the most diverse and rewarding shops in the city, in a mix of quiet streets and energetic squares. Although they are not on the same district, they are close enough for a walk between them, both of them have the highest concentration of antiques and second –hand shops in the city.